Maryam Maquillage: Holiday Joy Nail Art! 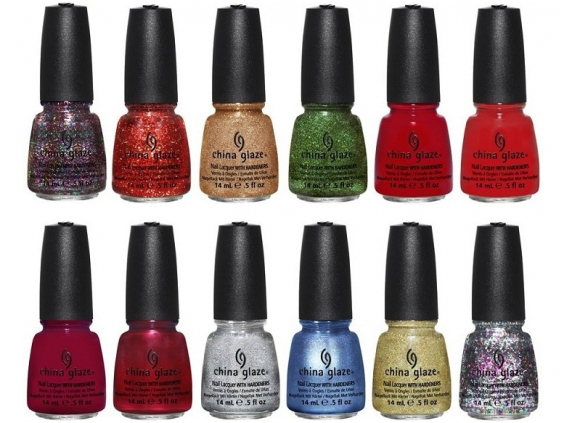 China Glaze Holiday Joy collection is perfect for every celebration of the season, starting with Thanksgiving and spanning all the way through to Valentine's Day. With a gorgeous compilation of satin, metallic, shimmer and glitter finishes, this festive collection is a must have for the season. You can certainly expect a Maryam Maquillage China Glaze Holiday Joy nail art for every celebratory occasion! China Glaze unique lacquers contain China Clay hardener to give the nails a porcelain-like finish and are free of DBP, Toluene and added Formaldehyde. These high end nail polishes are better for your nails and last much longer than drugstore brand polishes. Get the Holiday Joy Collection and much more at a fraction of the cost from my China Glaze supplier HBWigs.com. I used a 1.5 mm dotting tool to dot the flowers with Cranberry Splash and Champagne Kisses, plus craft store red and gold glitter to accent to center of the flowers. I topped the design with Duri Rejuvacote to seal in the glitter. This wearable nail art is the perfect addition to any outfit and will dress up your fingertips at the office or at a family Thanksgiving or Christmas dinner. Pair this nail look with a bright red lipstick and shimmery eyeshadow for the ultimate glam effect. Check out HBWIGS on Facebook & Twitter! Very Jollyyy!!! I love Red and this is just so gorgeous! definitely fit for the holidays! so pretty. I love it, and just in time for the holidays! love it and can't wait to do my christmas nails! !